AMID A CLIMATE of intense industrial unrest nationally, Tesco employees at 16 stores have joined the ranks of the discontented and announced “indefinite” strikes, to begin today, 14 February. Eight stores are to strike initially, with another eight due to hit the pickets on Friday. Nine of those 16 stores are in Dublin, while two in Wicklow and one each in Kerry, Longford, Meath, Offaly, and Monaghan are also set to strike. The reason for the strike is that workers who have been employed since prior to 1996 are to be moved to inferior contracts and have their pay greatly reduced, according to unions. Tesco categorically denies this. This particular issue has been at play for over 12 months now, with plans to move those long-term workers to new ‘modern’ contracts first revealed in January 2016. Prior to the announcement of strike action two weeks ago, the ongoing situation at Tesco was raised in Dáil Éireann by Independents4Change TD Joan Collins. Under Dáil privilege, she brought up the existence of Project Black, which Tesco was allegedly using as a means to shed employees. Hitherto, details of Project Black have been scarce. That has now changed, with the existence of the initiative being officially acknowledged by Tesco management in a leaflet recently distributed to stores. The company claims that the ominous-sounding title actually refers to “keeping Tesco Ireland in the black”, ie financially sustainable. The company further says that the project refers to “changes to the pre-1996 terms and conditions, no more, no less”. Unions say it is a “sophisticated and calculated” attempt at union busting, that is, a move designed to render Tesco’s workforce “fully compliant”, the first step of which was the encouragement of longer-term employees to take voluntary redundancy. 700 of those pre-1996 workers have taken such redundancy in the last 12 months (Mandate argues that the figure is much higher). Roughly 250 remain. Only about 40% of Ireland’s 50 Tesco stores are due to strike this week. Votes by Mandate members in favour of action have been taken in solidarity with the 250 workers still on the payroll who are working on contracts agreed pre-1996. Those remaining say they are facing pay cuts of at least 15% together with the restructuring of their terms and conditions. Tesco says it is merely applying a recommendation of the Labour Court from April last year and has at all times obeyed all industrial rules. The company has repeatedly called for Mandate to call off its strike and accept that Labour Court recommendation. Last week, it declared itself “shocked” at the suggestion that Mandate was encouraging its members to “shop with their conscience” in other stores. 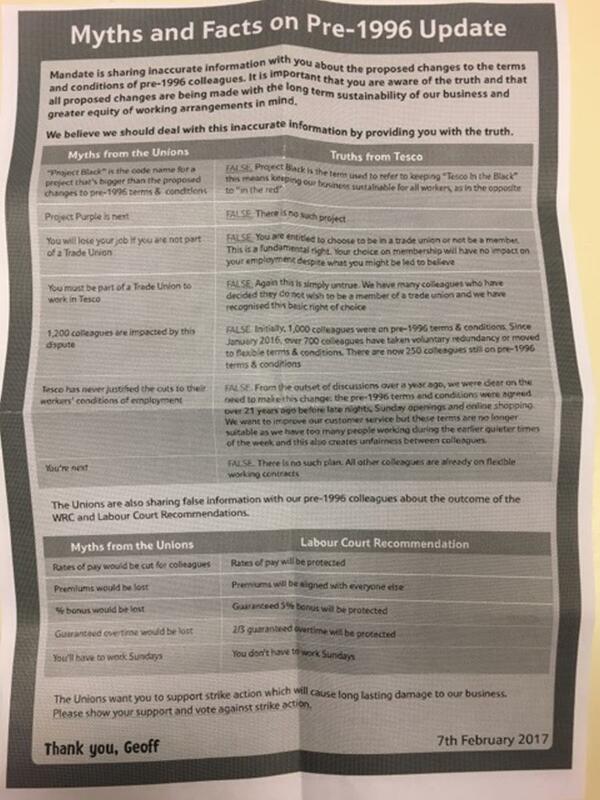 TheJournal.ie spoke to two Tesco employees (one of whom has 21 years with the company, the other 27, both wished to remain anonymous for fear of jeopardising the coming strike action) who are currently on pre-1996 contracts. They give an impression of a culture of fear and hostility that has sprung up in the past year. “We were always a closed shop with full union membership, always achieved via collective bargaining. That all changed last January when we were told that all contracts would be changed,” says one. They said we were going onto new contracts with less favourable rates and full flexibility. It was either take that or take redundancy. Both workers describe life at work now as “dreadful, hostile”. Our lives have been made very difficult. In the run up to the strike vote recently the people on other contracts were brought up and asked ‘how could you go on strike with people like this?’. People who’ve been getting €105,000 in redundancy. Well we were never offered that money I can tell you. They are convinced that a Project Purple also exists, and that it is the next phase for Tesco once Project Black, assumed to be the elimination of long-term contracts, is completed. “They have to get rid of the pre-96ers in order to move to Project Purple. And it’s all working towards having a ‘fully compliant’ workforce’,” one worker says. But there are people post-96 who have similar set hours and contracts to us. The same manager said to us “we’ll deal with them later”. The crux of the matter, according to these employees, is: ‘if the company won’t honour these contracts, who’s to say they’ll honour others going forward’. Right now it’s us being victimised. But if we give in, who’ll be next? Roughly two years ago, Tesco engaged the services of law firm Eversheds (now Eversheds Sutherland in Ireland) to advise on the company’s industrial relations, according to Collins. Regarding Eversheds, Tesco says: “Eversheds have never given Tesco Ireland advice on changes to pre-1996 terms and conditions.” The company has also categorically stated that Project Black is not the result of Eversheds’ consultancy. Unions meanwhile say the end goal of that consultancy is to “probably deunionise” the company’s Irish workforce. “The advice started two years ago and has been ramped up significantly in the last 12 months,” a source told TheJournal.ie. We’ve never come across this kind of sophisticated derecognition of trade unions. We are being consistently undermined, and weakened by the company’s approach. Union sources say that Tesco sees the approach taken by Dunnes Stores (where unions are not recognised, and the media is ignored completely) as the way forward, and that what is happening is consistent with the approach taken by the company in the UK in the past five years. “So now they’re still sitting down with us, but not faithfully, there’s no effort to engage,” our source says. This is the strategy advised by these professional consultants. If they’re brought in to get rid of 1,200 from the workforce, and 900 are already gone, then it becomes about what Tesco says is flexibility – so out of every 100 workers one will need to be flexible regarding hours. But it’s never been about that, it’s about undermining contracts, and what happens is a lot of people end up on precarious part-time contracts. Keeping something along these lines a secret is naturally quite difficult to do. The existence of Project Black was for a long time ignored by Tesco, and first came to the unions’ notice via an employee who was tipped off by a friendly manager. “Tesco were aware that we knew about it. And let’s put it this way, they weren’t denying it,” says our source. Project Black is now (relatively) out in the open. Recently, the following flyer has been posted in staffrooms across the country, finally acknowledging the controversial project. And denying the existence of Project Purple, saying it is a concoction on the part of the unions. Mandate see it as being more likely the next step in the company’s new industrial approach to its staff. “This is a very sophisticated, calculated approach to staff relations. You can take something totally inferior to what you already have, or you can take redundancy. And if you don’t you can take your union with you. Our members are feeling very isolated right now,” our source says. It may not be a household name, but Eversheds, first established in 1988, itself is one of the largest legal firms in the UK, and was one of the 50 largest in the world in 2009. It employs more than 4,000 people across the globe. The firm has been through countless corporate tie-ups in the last 30 years, the most recent involving its Irish affiliate in the opening weeks of 2017 – the company’s new name here is Evershed Sutherland following a merger made with US firm Sutherland Asbill & Brennan. A corporate consulting behemoth, Eversheds is not a firm to be taken lightly. It operates offices in at least 55 countries, including one each in Dublin and Belfast. Its so-called ‘union busting’ strategy for clients can be traced back 17 years to when the UK government reintroduced compulsory procedures for union recognition for the first time since the 1980s, though ‘union busting’ itself is possibly an unfair description – the strategy put in place could be more accurately referred to as union-resistance. “UK employers should view a union organisational effort as an economic heart attack,” Alan Lips of US firm Taft Stettinius & Hollister warned at the time. Eversheds itself seems to have been particularly well-prepared for the then new legislation – it embarked on a nationwide ‘trade union roadshow’ at the time to sell its new union resistance practice. Its clients have included Mercedes, upmarket grocery chain Sainsbury’s, and, interestingly, Ryanair. In 2007, the firm, contracted by Michael O’Leary’s budget carrier, was instrumental in arguing successfully in front of a European court that the only employment law that should apply in the case of aircraft employees is that of an airline’s home country – in Ryanair’s case, Ireland. That decision saw the case of three Belgium-based cabin crew who were dismissed by the airline five years previously overturned after a Belgian labour court ruled that they had been unfairly dismissed. Eversheds Sutherland did not respond to a request for comment from TheJournal.ie. The company has, for its part, rejected all the Irish unions’ claims in the last two weeks. Since the announcement of the impending strike action, Tesco has repeatedly released statements calling for Mandate, which represents over 10,000 of the company’s 14,000 Irish workforce, to accept last year’s Labour Court recommendation and to call off its proposed industrial action. Its approach has been to consistently call for Mandate to call off the strike, most recently on Sunday when the union suggested it would cancel the pickets if the company agreed to not change any pre-96 contracts without prior agreement. “All Tesco stores will be open today, Tuesday 14 February for business as usual,” the company said in a statement. Tesco calls on Mandate to accept the Labour Court recommendation which affect 250 of the 14,500 colleagues in Tesco. It remains as the means to resolving the dispute which affects only a small number of staff and the indefinite strike is disproportionate action for Mandate’s other members in the company. The company likewise underlines that “in the stores that have been balloted less than half of colleagues working in those stores actually voted in favour of strike action”. “Project Black is the internal working name for changes to the pre-1996 terms and conditions, no more no less,” the company told TheJournal.ie. 1,000 people were in scope at the start of this process and 700 colleagues have opted to take voluntary redundancy with the average payout of €105,000. Tesco says categorically that Project Black is not the result of Eversheds’ consultancy, and that “there is no such project” as Project Purple. The company added that a recent pay increase granted to employees, which had been delayed for 10 months, is the fourth successive annual 2% pay increase it has made. Email “What on earth is Project Black? And why are Irish unions so worried about it?”. Feedback on “What on earth is Project Black? And why are Irish unions so worried about it?”.